It is 5.44am, I have been up since 4.30am, and I am on the early train to London with bags full of homemade cake! As part of my other life I co-direct the Centre for the Philosophy of History at St Mary’s University. As part of our remit we organise a seminar series and ad hoc symposia and conferences on philosophical issues surrounding the production and consumption of historical narratives. Today we are running one called Aesthetics, Postmodernism and the Before Now. It looks like there will be some very interesting papers and good discussion – I am looking forward to it. See here for information on it. 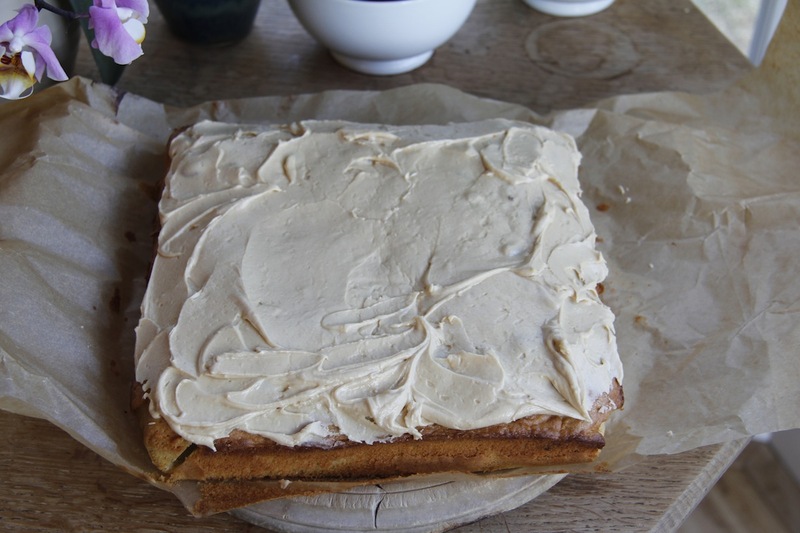 Anyway, as everything is improved by homemade cake, I make cakes for these events – we can even use some of our research funding for this purpose – actually it is cheaper than buying cakes in and it goes without saying that the cakes are nicer! I made three different cookies and cakes for the event today: coffee and walnut cake, ginger, raisin and oat cookies, and something my mum used to call ‘fudge’. 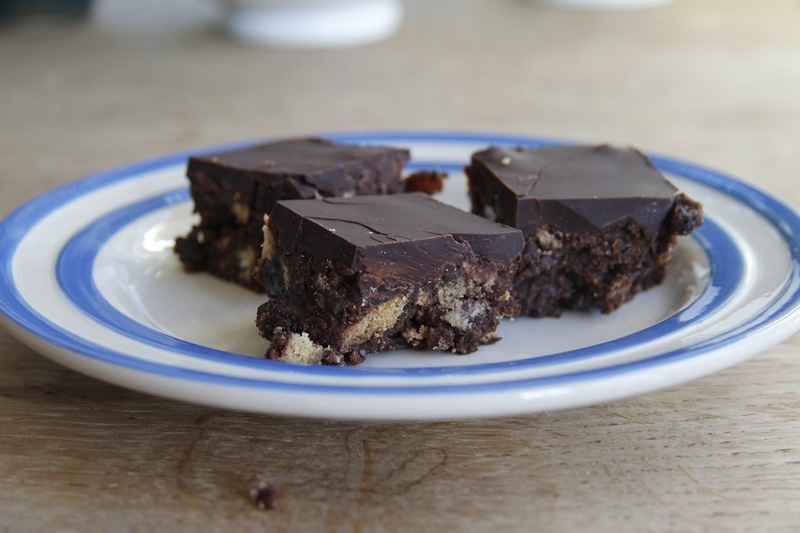 ‘Fudge’ – this isn’t real fudge, but it is delicious. The key here is to use extremely good chocolate on top – not cheap cake covering. Really, it should be a rule of life – always use good quality chocolate or don’t bother! I imagine you can weigh out ingredients for this, but I just randomly mix things together and it always works out OK – it is very forgiving. You could add in glace cherries, other dried fruit, or nuts as well, if you wanted. 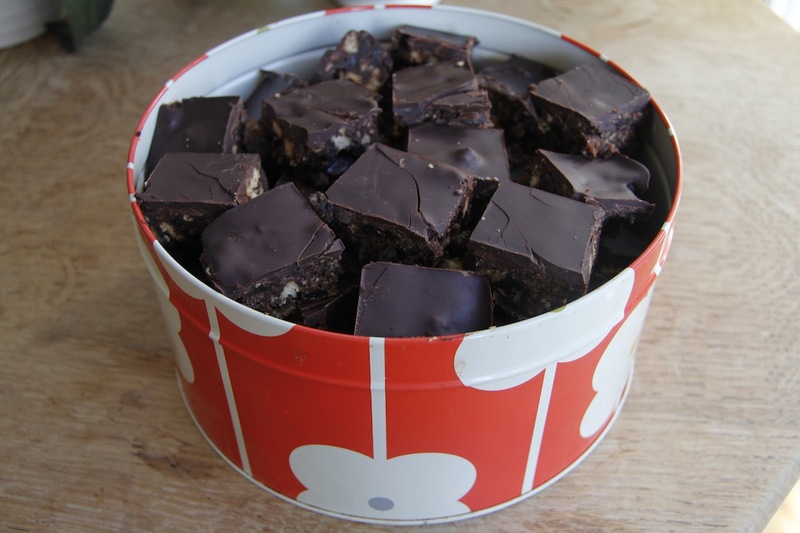 Ingredients: 250g butter, half a tin golden syrup, about 4-5 heaped tbs cocoa -maybe more (use quality cocoa), I packet of digestive biscuits, lots of raisins, lots of good quality chocolate (I use Montezuma Buttons – see here. Melt the butter, syrup and cocoa in a pan, when liquid stir in crushed biscuits and raisins. Press into a flat pan about an inch deep and leave to cool. Once cool, melt the chocolate in a bowl over simmering water and then pour over the top. Refrigerate and then cut into pieces. This makes a lot of ‘fudge’. Coffee and Walnut Cake: Ingredients: 175g butter, 175g sugar, 175g self raising flour, 1 tsp baking powder, 1 espresso, 3 eggs, 100g or so of chopped walnuts. Put everything apart from the walnuts in a mixer and mix until combined. Add the walnuts. Put into a lined baking pan and cook at 170C for about 20 minutes until it is risen, the top is golden brown and when pushed it bounces back. Allow it to cool on a baking rack. Meanwhile make the icing. Use whatever leftover soft butter that you have and beat with icing sugar and an espresso. Keep adding icing sugar and coffee until you have enough icing that is of a spreadable consistency, then spread it on top. It would be nice with walnuts scattered on top, but I didn’t have any left. I made a double batch at the same time as there are quite a few people to feed. 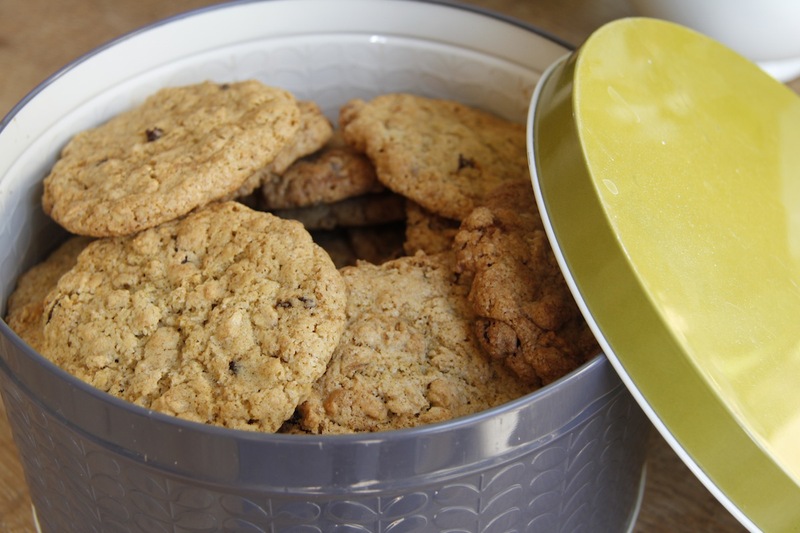 I also made Ginger and oat cookies, but will write that recipe up another day as I have work to do now! Don’t know which sounds better, the cake or the seminar. Who am I kidding? It’s the cake! Of course it is the cake – the seminar was interesting, but cake always wins!